Crown molding can add an impressive architectural touch to a room or to an entire home. It is especially attractive in rooms with high ceilings, and there are a variety of unique molding styles that can complement different types of interiors. Depending on the type you choose, crown molding can really enhance the ambiance of a room. It can be used to help a room fit in better with different interior design styles, and it can also be used to accent the height or area of the space. Another great thing about crown molding is that it is a DIY project that offers a high ROI for a relatively low cost. If you already have tools like an oscillating saw or a sander power tool, the cost will be even lower. If not, investing in an oscillating power tool now will make future DIY projects easier. When it comes to crown molding, you can have a significant impact on the appearance of a room without having to invest a lot of money. All you need is the right tools, your molding, and a little bit of knowhow. You have many options to consider when looking for the perfect crown molding. There are several unique designs, and molding comes in different sizes. For the design, the choice is mostly going to depend upon the style of the home. Based on the interior design, architecture, and style of the home, some types of moldings will fit in well, while others may look out of place. When it comes to size, you have a few things to consider. The most important factor is the ceiling height. In general, most experts would recommend going with a half-inch to an inch of molding for every foot of ceiling height. That means if you have a nine foot ceiling, look to install molding that is between 4.5 and 9 inches high. Having the right tools is an important part of getting this job done right. Now, how you go about hanging crown molding will depend on the project, your preferences, and the types of tools you own. The following are some recommendations for tools that can help you when you are hanging crown molding. You are going to need to make miter cuts for the outside corners of the room. 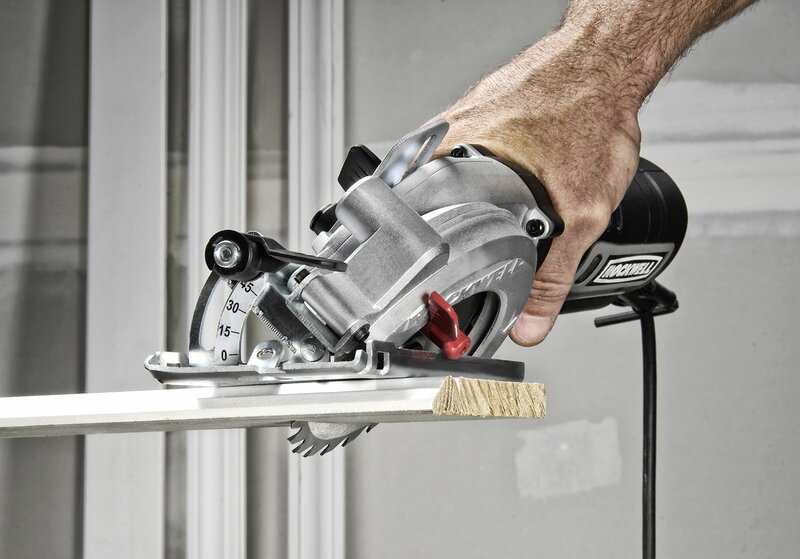 While you can use a manual saw with a miter box, an electric miter saw will serve you better. It will make the work go faster and more easily, and you will be able to achieve cleaner, more precise cuts. Coping is probably the best option for any inside corners that may be in the room. You could use a coping saw to get the job done, but you could make the work easier with an oscillating power tool. Using one with a spiral oscillating tool blade, you should be able to take some of the effort out of the work. It will also likely allow you to get cleaner cuts. 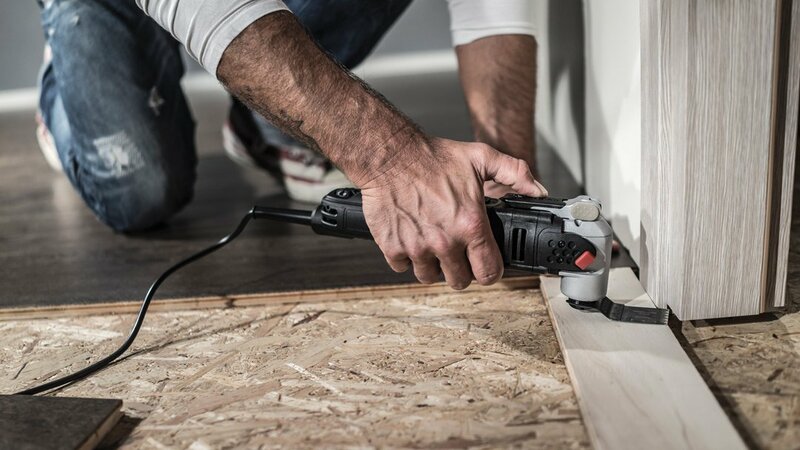 Working with a versatile piece of equipment like the Sonicrafter F50 4.0 Amp Oscillating Multi-Tool allows you to do much more than just cope your corners. With the right oscillating tool blades, it could come in handy throughout the job. As an example, if you need to remove old molding before hanging the new, you could use your oscillating power tool with a bi-metal blade to cut the nails and remove the molding faster. You are definitely going to need to nail the molding up. While this could be done with the traditional hammer and nails, a nail gun will make the work easier. With a nail gun, you can have a free hand to hold the molding as you nail. Additionally, the tool ensures that the nails go through nice and smoothly, eliminating some of the problems that come when driving nails with a hammer. You might need to do some light sanding to make sure everything fits together. Manual sanding can work to smooth joints when necessary, but using a sander tool will make the job easier. You may also find an area of the wall that has a bevel. In a situation like this, sanding by hand could be a lot of work. Using a sander power tool like the 3.3 Amp 5″ Vibrafree Random Orbital Sander will reduce the time and effort. Hanging the molding can be difficult if you are working by yourself. For this reason, a work support stand makes a good investment. With the Rockwell Jawstand, you have a convenient work support that can also act as a third hand. You can easily rig up a support that will hold the molding in place as you work. Furthermore, it is also ideal as a support and feeding device for when you are making cuts with your miter saw or oscillating power tool. Installing crown molding isn’t overly complicated when you have equipment like an oscillating power tool fitted with the right tool blades, and a sander power tool to help you get the job done faster. When done well, crown molding can increase your home value and help make your interior more aesthetically pleasing. Find the perfect oscillating power tool and accessories at Rockwell! All you need is the right tools, your molding, and a little bit of knowhow.